i95Dev is pleased to announce its participation in the world’s premiere global e-commerce conference – Imagine eCommerce Worldwide Conference 2014 on May 12-14 at the Hard Rock Hotel in Las Vegas. Being one of the Silver sponsors, we would like to take this opportunity to showcase our e-commerce expertise through our products, solutions, services and exclusive Magento extensions. If you go, you definitely must stop by our booth to explore and understand our latest e-commerce offerings. Magento’s annual Imagine conference brings together more than 1,700 online merchants, Magento developers, digital industry experts, and open-source software enthusiasts from over 35 countries. Imagine features networking and collaboration opportunities with commerce industry peers, seminars and workshops, and a vendor expo floor. One of the most exciting guest speakers coming this year is best-selling author Malcolm Gladwell (“The Tipping Point” and “Outliers”), named one of the 100 most influential people by TIME magazine. Gladwell’s latest book, “David and Goliath,” challenges the conventional wisdom surrounding disadvantages in business, and makes arguments for the value of adversity. You’ll also hear how Magento and eBay Enterprise are developing new ways to help you grow and transform your business. 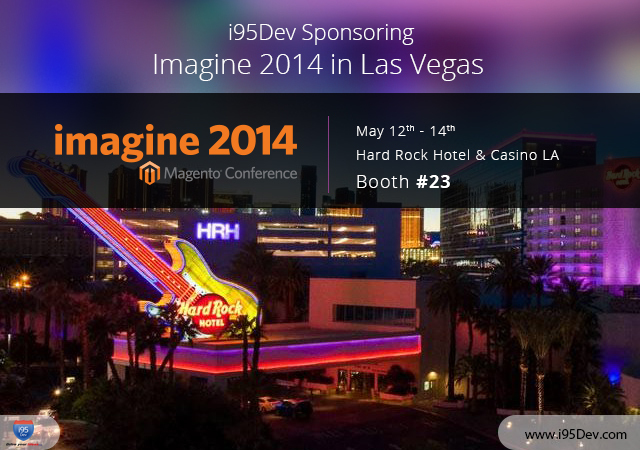 Talk to our experts and learn how B2B business can leverage ecommerce with i95Dev B2B modules for Magento. If you’re not already registered for Imagine 2014, get on it! You won’t want to miss the inside line on what the most successful e-commerce businesses and solution providers will be doing in the years to come. After all, if there’s one sure bet in Las Vegas while this conference is going on, it’s that the attendees at Imagine will lead the future of online commerce.